The New England Historic and Genealogical Society at http://www.newenglandancestors.orgf. The Connecticut Society of Genealogists at http://www.ctfamilyhistory.com Now Offers Footnote.com as part of membership. Pilgrim Hall Museum. http://www.pilgrimhall.org . General Society of Mayflower Descendants at http://www.themayflowersociety.org . Caleb Johnson's Mayflower Website at http://MayflowerHistory.com. 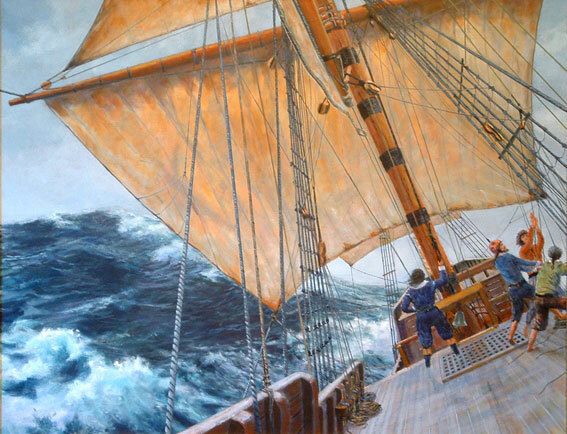 ........ and met with many fierce storms, with which the ship was shroudly shaken, and her upper works made very leaky; and one of the main beams in the mid ships was bowed and cracked, which put them in some fear that the ship could not be able to perform the voyage. In sundry of these storms the winds were so fierce, and the seas so high, as they could not bear a knot of sail, but were forced to hull, for divers days together. 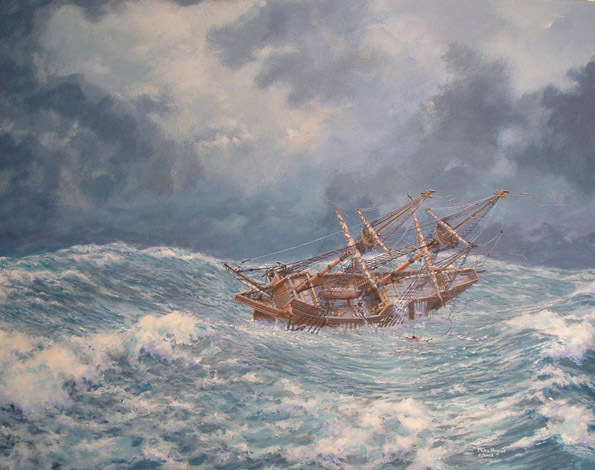 In 1620, at this time, another disaster struck the storm tossed Mayflower in mid Atlantic. One of the passengers, a servant called John Howland, was swept overboard by a mountainous wave and then miraculously rescued. John Howland went on to be the thirteenth signatory of the Mayflower Compact and was present at the first Thanksgiving. He sired 10 children and had 82 grandchildren. Had he lost his hold and drowned on that fateful day, the two Presidents Bush, President Roosevelt and Humphrey Bogart would not have existed as they are all descendants of John Howland and Elizabeth Tilley. On November 9th ,1620, the Mayflower's crew sighted Cape Cod and attempted to sail south to the mouth of the Hudson's River, near modern-day Long Island, New York. The Mayflower anchored off what is now Provincetown Harbor on November 11, and over the next month put out several expeditions to survey Cape Cod and the vicinity. The voyage from Plymouth, England to Plymouth Massachussetts is about 2,750 miles, and took the Mayflower 66 days to cover that distance. The Mayflower left England with 102 passengers, including three pregnant women, and a crew of unknown number (approximately 25 to 30). While the Mayflower was at sea, Elizabeth Hopkins gave birth to a son who she named Oceanus. After the Mayflower had arrived and was anchored in Provincetown Harbor, Susanna White gave birth to a son, who she named Peregrine (which means "one who has made a journey"). Only one passenger and one crewman died during the arduous voyage. Within 6 months of the landing, no fewer than 52 of the Mayflower passengers died in an epidemic, including 14 of the 18 wives and 13 of the 24 husbands. Surprisingly, the survivors resolved to remain. 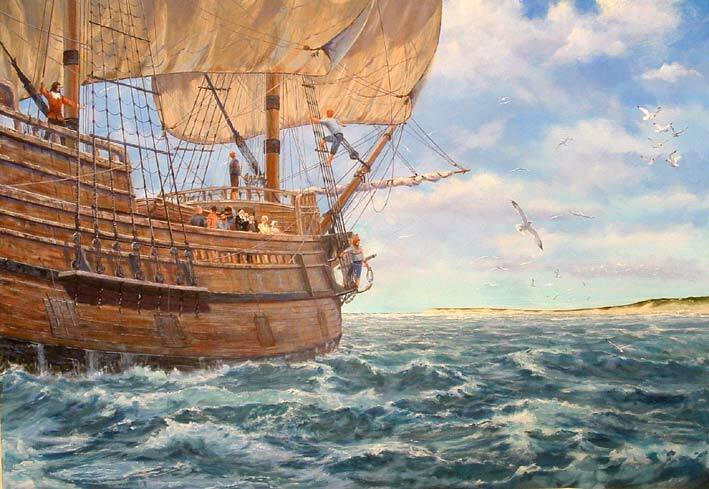 On April 5, 1621, the Mayflower set sail, bound for England, arriving back on May 6, bringing news of the successful establishment of Plimoth: but with a devastating 50% of the Pilgrims having lost their lives, and with no cargo of lumber, furs and fish for profit. The Mayflower then sailed to France, bringing home to London a cargo of salt. Shortly after, her master and quarter-owner, Christopher Jones, fell sick. He died in March 1623. 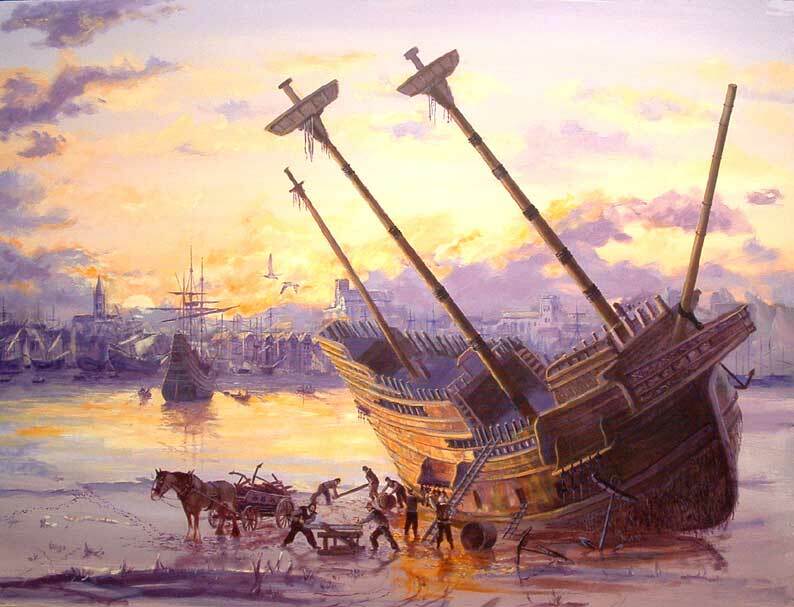 My painting shows the Mayflower in 1624, sitting in ruins in the river Thames. The sunset is symbolic of the end of the life of the vessel. The Port of London is in the background, soon to exploit the riches of the New World, unaware of the historic importance of the decaying hulk in its midst. The Mayflower was valued at £128, including 5 anchors, the suit of worn sails, an old pitch pot and kettle (a large cauldron). The ship was probably sold off as scrap lumber. In 1920, J. Rendal Harris claimed to have discovered Mayflower timbers in amedieval barn at Jordans, situated 25 miles northwest of London. Despite the total lack of evidence and no supporting documentation, this theory has been accepted by the mass media, and has found itself in "National Geographic," and as a question on Jeopardy. Nonetheless it is almost certainly not the Mayflower. I have painted some foxes on the side of the cart on which the timber is being loaded, alluding to this hoax!